Construction aggregates are inert granular material such as gravel, sand, and crushed stones, which are used with a binding medium such as lime, water and portland cement, and others to form compound materials such as concrete and asphalt concrete. Growing infrastructural and residential sectors are expected to drive growth of the construction aggregates market over the forecast period. According to the office for National Statistics, the value of construction new work was US$ 114,977.3 million and is expected to grow continuously, owing to growing private sector. Among product type, the crushed stones segment is expected to account for a significant market share over the forecast period. According to U.S. Department of the Interior, U.S. Geological Survey, in U.S., the total of 1.33 billion metric tons of crushed stones was produced for consumption in 2015. Among end-use industry, the residential segment is expected to account for a significant revenue share over the forecast period. This is attributed to growing residential construction. According United States Census, the value of residential construction was US$ 560,088 million. Asia Pacific is the fastest growing region in the global construction aggregates market, owing to increasing construction market in emerging economies such as India and China. According to India Brand Equity Foundation (IBEF), India is expected to become third largest construction market by 2025, globally. Also, India, U.S., and China are expected to account for around 60% of all global growth in the sector by 2025. North America is expected to account for significant market share in the global construction aggregates market, in terms of revenue over the forecast period. 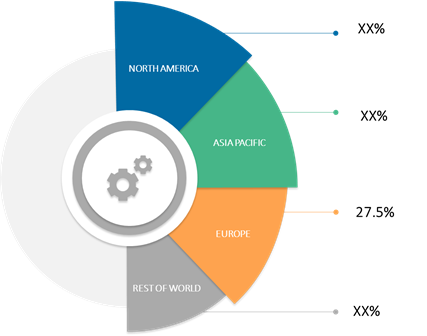 Increasing demand for recycled aggregates coupled with growing investment in constructional activities is fueling growth of the construction aggregates market. According to United States Census Bureau, the U.S. spends over US$ 1 trillion on infrastructure construction annually. Europe held substantial market share in 2017, in the global construction aggregates market. Aggregates are extracted in larger quantities in European countries such as U.K. as compared to other minerals, which is fueling growth of the construction aggregates market in this region. According to the Office for National Statistics, primary aggregates, which are produced from naturally occurring mineral deposits, accounted for around 55% in 2009. The construction aggregates market was valued at US$ 358.80 Bn in 2016 and is expected to expand at a CAGR of 6.3%, in terms of revenue, during 2017 – 2025. Europe accounted for the lucrative revenue share of 27.5% in the global construction aggregates market in 2017, and is expected to maintain its dominance over the forecast period. Various manufacturers are engaged in merger and acquisition to enhance their global presence. For instance, in 2017, Aggregates Industries in Europe, acquired Kendall Group, one of the leading ready mix concrete and aggregates manufacturer to expand its operations in South of England. Among end-use industry, infrastructure segment accounted for around 36.0% of global construction aggregates market share in terms of revenue in 2017, and is projected to witness significant growth over the forecast period. Growing trend of using recycled aggregated, owing to its cost effectiveness and it is considered as green construction material, which is further driving growth of the construction aggregates market. Some of the key players operating in the global construction aggregates market include Vulcan Materials Company, PJSC LSR Group, Heidelberg Cement AG, LafargeHolcim Ltd, Martin Marietta Materials, Inc., CEMEX S.A.B. de C.V., Eurocement Holding AG, CRH plc., Adelaide Brighton Cement Ltd., and Rogers Group Inc.
Construction aggregates include recycled aggregates, crushed stones, sand, and gravels used in construction. Aggregates are used in the production of construction products such as asphalt, ready-mixed concrete, lime, and mortar. Increasing demand for aggregates owing to construction activities is driving growth of the construction aggregates market over the forecast period. According to Mineral Products Association (MPA), around 90% of all aggregates were consumed by construction industry in U.K.
Asia Pacific is one of the major contributors to the construction aggregates market, owing to constantly growing construction industry in emerging economies such as India and China. According to India Brand Equity Foundation (IBEF), the Indian construction industry is expected to be valued at US$ 5 billion by 2020. Various manufacturers are focused on organic and inorganic growth strategies such as mergers, acquisition, and joint venture in order to enhance their global presence. For instance, in January 2018, Vulcan Materials Company, one of the key player in construction aggregates market, acquired Aggregates USA, llc to expand their footprint in Florida, South Carolina and Georgia. Key companies covered as a part of this study include Heidelberg Cement AG, PJSC LSR Group, LafargeHolcim Ltd, Martin Marietta Materials, Inc., CEMEX S.A.B. de C.V., Eurocement Holding AG, CRH Plc., Adelaide Brighton Cement Ltd., Vulcan Materials Company and Rogers Group Inc.
*Browse 180 market data tables and 110 figures on "Global Construction Aggregates Market - Global forecast to 2025”.